Need to quickly send out a message from your Mac to one of your contacts with iMessage, someone on AIM, Yahoo Messenger, or Facebook messaging? So long as the messaging service is configured for use with the Messages app on the Mac, you can quickly send out a new message directly from Notification Center in Mac OS X. This also enables the ability to quickly post tweets from the notifications view if you have Twitter setup within Mac OS X, that button will be alongside the messages option, but the latter choice remains our focus here. 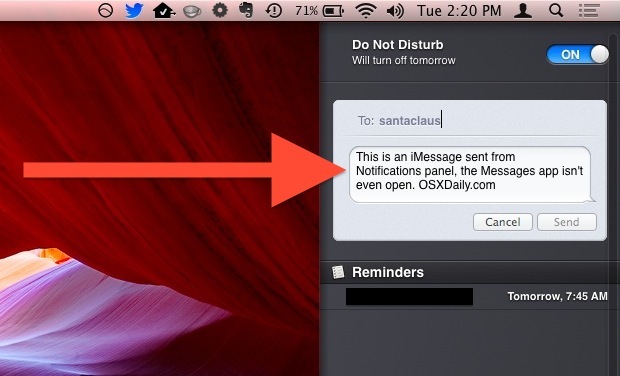 Simple and quick, you don’t even need to have the Messages app in OS X open or active to use. That actually applies to both sides of the conversation too, because not only can you send a message right from Notification Center, but you can also respond from there as well when an alert comes in. Of course, to access the full set of iMessage based features like animated GIF viewing, multi-chat, buddy lists, and everything else, you will need to use the full application, however. This is a very useful feature on the Mac, but it really should be in the Notification swipe-down panel of the mobile world of iOS too. For some reason or another, the iPhone / iPad used to have this to some extent with posting to Twitter and making Facebook posts, but that ability was mysteriously removed in new versions of iOS. Hopefully it will make a return to the mobile side of things as well, where many of us do the majority of our instant messaging these days anyway. Good Tip. Is there a way to make the preview of imessages that shows up in the upper righthand corner show more then just two lines? I am on windows but I like this functionality on mac, thanks for providing this trick. 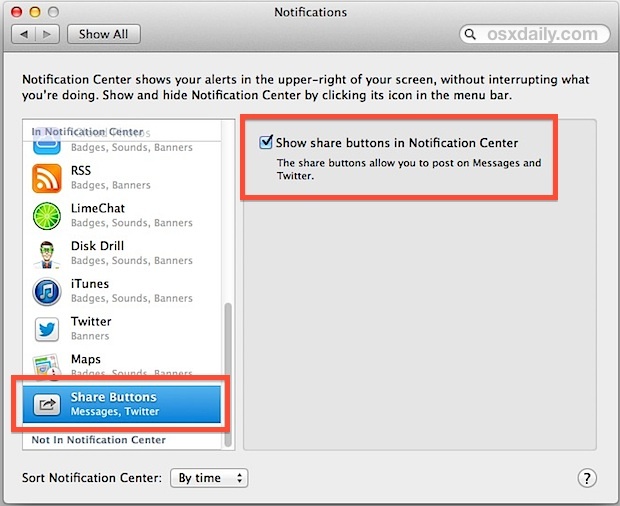 Share button for Messages is not showing up in Notification Center, nor as an option in Notifications preferences. 10.8.5. This appears to be widespread. Anybody know what’s going on? Not true. The Twitter share option is there in my 10.8.5; Messages not — but many 10.8 users are reporting both options present. Others, neither option. Yet others, one or the other. “10.9 or newer” doesn’t make much sense, btw.